This is an archive of my last article on Blackberry devices, covering OS 5 and earlier. I gave up on Blackberry as of OS 6. And when I saw an announcement that the company formerly known as RIM had decided not to support Japanese localization for the Blackberry 10 because updates would be "too hard", I decided not to bother looking at the latest generation's Chinese support. Let me know if you think I should. The good people at RIM make it as hard as they possibly can for you to add Chinese or any additional languages to your Blackberry device. Before installing the new OS you must do a special backup of all your data and all your apps (not the usual backup, which only saves data in the default Blackberry apps). You may also have to perform a little trick on the installer software: if you have downloaded an OS intended for a different carrier's phones you must delete a file called "vendor.xml" on your PC to fool the installer. Then you flash the new OS onto your device via USB, and restore as much of your previous data and apps as	you can. You'll find the details on Crackberry.com and other BB enthusiast sites. After that process is complete you'll have Chinese fonts, plus input methods that may include Pinyin, Wubi, Zhuyin (Bopomofo), Cangjie, Cantonese Jyutpin and others. As of OS 5 you can use Pinyin for both simplified and traditional characters on many Blackbery phones. In OS 4 you can only use Pinyin for simplified characters, but not for traditional characters unless you add a third-party Pinyin input method. Q9 offers one such third-party input method package direct off their website. Although it's not an approved Blackberry App Store product, I was desperate enough that I installed Q9 despite my misgivings...only to get a Java exception error on every restart before I'd even paid, unlocked and tried it, so I deleted Q9 off my device and can't tell you anything about it at all. 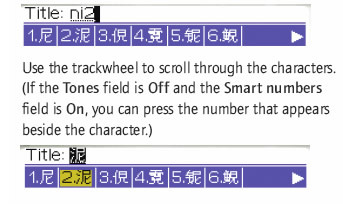 Here's a link to some old SingTel instructions for Blackberry Chinese input methods (PDF) . Recent versions of the OS look a little better than this but the information is still basically valid. Have fun! If you install the big All Language download, the OS may later ask if you want to delete some languages to save space. That's because Blackberry systems have almost no room for fonts and apps. In fact, one aspect of the poor web browsing experience on my Blackberry Bold was that my browser cache quickly filled up all available app space and I had to do frequent resets to clear it up. I'm not certain OS 6 is all that much better, but I do know that even the latest BlackBerry Torch sold in the USA still will not support East Asian language input out of the box, although some versions may at least contain the display fonts. To be able to type in an Asian language you will still have to download a replacement OS and install it from your PC, and there will still be many limitations on what you can do. At a certain point I decided: you know what, for the amount of time I'm spending on this why don't I just move to a truly multilingual device with a better browsing experience and better input methods, and devote my time to setting that up just once instead? Bye bye RIM, <<sniffle>> it's been a good five years but I think we've grown apart. This was a difficult relationship anyway, my little Blackberry. I always had trouble accepting how high-maintenance you were, especially after life with my dearly departed Palm. It's not you RIM, it's me. Really, it's for the best. "Microsoft", "Windows", "Linux", "Apple", "iPhone", "Blackberry" and any other trademarks on this site are the sole property of their respective owners.